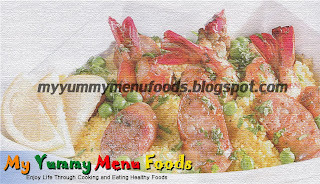 Seafood is rich source of protein, vitamins and minerals. Not only delicious but nutritious as well. This couscous recipe is so easy and simple dish for your perfect dinner. 1. In a large frying pan, add half the oil and sauté onions and garlic over medium heat. 2. Add the seafood and season to taste. 3. Cook for approximately 5 minutes and deglaze with the white wine. 5. Using the same pan, add the remaining oil and the sausage, peppers, olives and peas. Boil the water in pinch of saffron powder. Put the couscous in the Pyrex bowl and add the boiling water. Let it stand, covered tightly with a plastic wrap for at least 5 to 8 minutes. Take the wrap off and using a fork to fluff the couscous. Assemble on a serving plate combining the couscous with the seafood and the vegetables.